'Merry Christmas', around the outside with 'and a Happy New Year' in the centre of this circle stamp. With little stars and snowflakes. This will make a lovely combined greeting and embellishment if layered and fixed with foam pads onto cards. 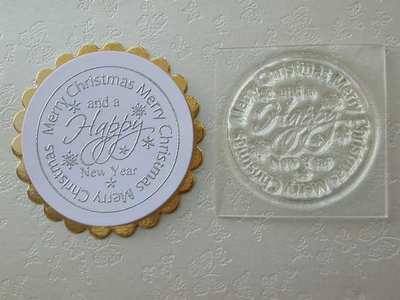 The example has been stamped, embossed with Detail silver powder and cut out with a Nestabilities 4.8 circle cutter and layered onto a Nestabilities 5.5cm scallop die-cut using gold mirror card. 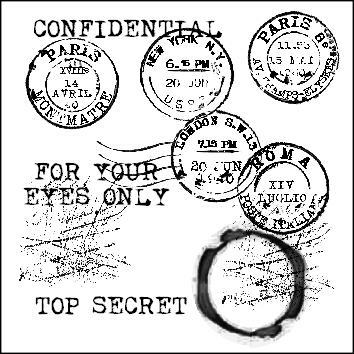 stamped area 1 5/8" x 1 5/8" - 4cm x 4cm.